Farce the Music: Lyric Video Premiere: Becky Warren "She's Always There"
Lyric Video Premiere: Becky Warren "She's Always There"
Becky Warren's album War Surplus was named on a couple of ballots for Farce the Music's Top Albums of 2016 list, and today we've got an exclusive premiere of her lyric video for the confessional drinkin' song, "She's Always There." Check out the biography and links of interest below the video for more information on this exciting singer/songwriter. Warren is recommended to fans of Lucinda Williams, Mary Gauthier, Cody Jinks, etc. With her debut solo album, War Surplus, Nashville singer/songwriter Becky Warren relays the affecting, gritty and candid tale of the relationship between an Iraq-bound soldier named Scott and his girlfriend, June. As the story unfolds, the two meet, fall in love, get married and then struggle to hold it all together when he returns from his deployment a changed man living with the echoes of PTSD. From the record’s award-winning lead track “Call Me Sometime” straight through ‘til the last note, Warren’s potency as a songwriter is on full display, as she weaves a compelling musical narrative rooted in her own life experiences and the rich sounds of Americana and rock & roll, all the while channeling the bold yet unaffected spirit of Neil Young, the compassion and grit of Steve Earle, and the fiery, bourbon-soaked vocals of Lucinda Williams. 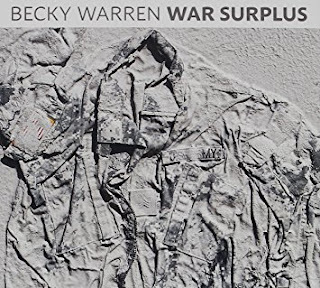 Beyond the top-notch musicians, brilliantly crafted songs and tasteful production, part of the reason War Surplus hits with such impact is the very personal, almost autobiographical nature of Warren’s material. Just like the June character she created, Warren married a soldier back in 2005. A week later, he was deployed to Iraq and eventually returned home with PTSD. After four tumultuous years of trying to work through the fall out, they eventually, amicably, split. So while Scott and June are characters, and their story is a fictional account, Warren has the advantage of knowing what it’s really like—of being able to draw from a deep well of personal experience, and it lends the record a powerful authenticity and empathy. And to take the writing beyond the scope of her own experiences, Warren also drew from several veteran-penned memoirs, in particular My War: Killing Time in Iraq by Colby Buzzell, a book that inspired War Surplus standout “Stay Calm, Get Low,” and ultimately led to Buzzell—a freelancer for New York Times and Esquire—writing the album’s liner notes. Within a month of her divorce, though, she was writing again, and would eventually record a second Great Unknowns album, 2012’s Homefront. Though her old bandmates were now scattered across the country and unable to tour, Warren kept cranking out powerful songs, including “Call Me Sometime,” which won her the 2014 Merlefest Songwriting Competition and the 2015 Kerrville New Folk competition. It’s an impressive feat when you consider the past winners of these contests—career artists like Steve Earle, Lyle Lovett and Gillian Welch.